This week at Bungie, we breathed new life into the most important part of Destiny. I am talking, of course, about the Purple Ball in the Tower. This evolution is another example of engaged innkeepers serving the tenants of their world. “The Purple Ball has been reborn - shinier, more metal, but just as purple in spirit,” Technical Artist Nate Hawbaker assures us. 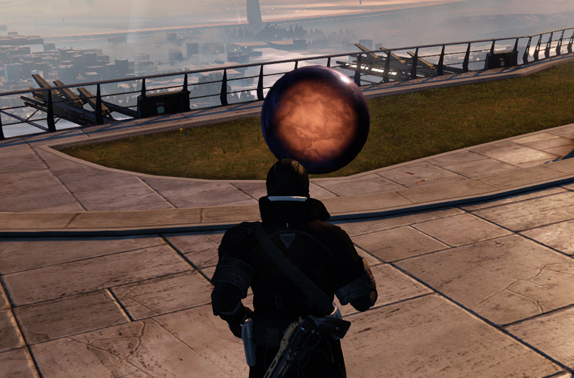 “It has captured the hearts and minds of so many Guardians who visit the Tower in search of their combat wares. We sought to honor their playful rituals by infusing it with the magic that players have clearly assigned to the second most important sphere in the game." The response has been greater than we could have hoped. All hail the Purple Ball – along with all the enhancements, fixes, tweaks, adjustments, refinements, and expansions in Update 1.1.2 – now available to anyone who plays Destiny. As for what’s next? Update 1.2.0 is our destination. 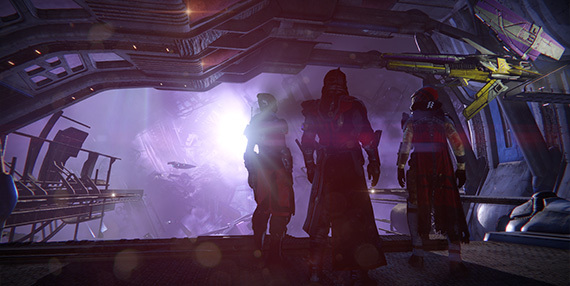 Included in its cargo will be the House of Wolves, but it will impact the experience of every player of Destiny, whether they expand their horizons or not. In the lead up to the update you downloaded this week, we unpacked its contents and introduced you to some of the people who did the work. We’ll do the same thing in the time between now and when the hunt begins. And, we’ll do it live . The House of Wolves has been revealed with a new prologue trailer. Seen it? Even if you have, you should watch it again. It’s easily the coolest trailer to hit the Internet all week. Right ? We hope you want more details, because that was just the beginning of a conversation about our next adventure. You have questions. We’re as anxious to answer them as you have been to ask them. You’re invited to visit The Reef with us next week. Join us for a walking tour of the Vestian Outpost. Meet the vendors with whom you’ll trade bravery for treasure. Learn about their motivations and objectives. Creative Director Christopher Barrett will be your guide. Special community guest Gothalion will ask the questions about what the next expansion to Destiny means for all of us. Who will issue our new walking orders? What do we stand to gain from this alliance? What will happen to our existing gear? Will we ever want to visit the Tower again? Tune in and learn about what awaits you. We know you want to prepare for the next mission. This is your chance to get equipped with solid intel to help you plan your attack and manage your arsenal. The people on the Destiny Player Support team are the first responders on the Bungie.net forum. Some of them are Bungie devs. Others are community volunteers just like you –with a heart built for service and a fancy badge to help them stand out. This is their report, live from the Operations Center. In Update 1.1.2, Bungie has added new audio controls that can be found under the Settings tab. These controls have some settings worth noting. You can read up on these settings in our 1.1.2 Audio Guide . Players have reported that they are unable to find Blades of Crota on Moon Patrols. If you’re still looking for the Blades of Crota, you can still find them in the Fist of Crota mission. There has been some confusion regarding reward packages in the Postmaster. Please note, new deliveries sent to a full Postmaster inbox can trigger erroneous notifications. We have added additional Vault space. Grab some rewards from the Postmaster and use your expanded Vault today. We recently updated the Microsoft authentication path for Bungie.net to require an associated Xbox Live Gamertag via www.xbox.com . This change in authentication will help enable Xbox One friends to be visible on web and the Companion App. It goes live on Monday. For all previous changes to sign in paths, please see our last Bungie.net Update. To learn about Bungie.net account management please read our Account Linking FAQ . Associate that Windows login with a Gamertag, Guardians. This is your final warning! When we make that change on Monday, those of you who do have your username properly linked to a player account (PSN or XBL) will benefit from new drag-and-drop inventory management.